The highly skilled craftsman who individually hand-blows each chimney works out of his shop located in the New England area. 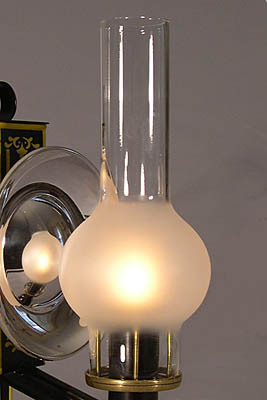 All glassware profiles have been copied from period pieces and all glassware is made using Pyrex glass that will not crack as a result of the heat generated by oil-burning lamps. Top and bottom cut edges are fire polished to help reduce chipping in these two vulnerable areas. Fitter diameters can be custom adjusted to meet your particular needs and where noted, custom heights can be ordered. These reproduction Argand chimneys come in two styles and two stock heights. The difference in styles is in the shoulder design: the chimney pictured to the left has a soft shoulder and the chimney to the right has a sharp shoulder. Both styles show up on period chimneys. Stock heights are 8-1/2" and 9-1/2"; the fitter outside diameter is 2". This fitter dimension seems to be fairly standard. Both top and bottom edges are fire polished to reduce the chance of chipping in these vulnerable areas. 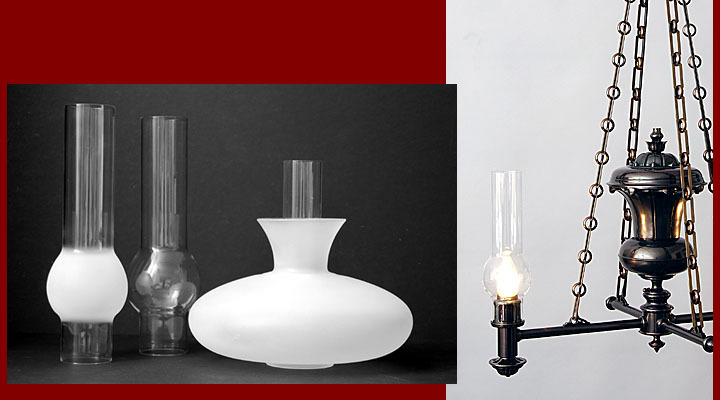 Chimneys are made using Pyrex glass to minimize the risk of breakage when they are used with oil-burning lamps. Custom chimneys are available - call for a quotation. 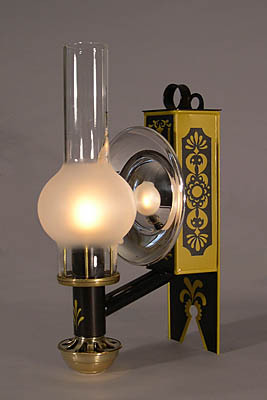 Solar chimneys are available in two sizes. The large chimney is 10-1/4" high, the top-outside diameter is 1-5/16", and the diameter at the bottom is 2-1/8". The flair diameter measures 2-13/32". The small chimney is 8-3/8" high, the top outside- diameter is 1-3/8", and the diameter at the bottom is 1-13/16". The flair diameter measures 2-1/16". These sizes seem to be fairly standard but if you should need a chimney with custom dimensions please call for a quotation. The top and bottom edges are fire polished to reduce the chance of chipping in these vulnerable areas and the chimneys are made using Pyrex glass to minimize the risk of breakage when they are used with oil-burning lamps. This chimney and shade were developed for use on one of two custom designed hanging fixtures that I made for the restoration of the Separate Prison located at the Port Arthur Historic Site in Tasmania, Australia. Three sketches of the Prison's interior that were drawn in the period along with surviving documents that are in the Site's archives were used to develop the various lighting fixtures. Enlarging and tweaking the photo of one of the sketches yielded an image of the chimney as it has been reproduced and is pictured here. The shape of this chimney is similar to that of the Chimney/shade with the exception of the diameter and height of the portion above the bulge. The fitter of this chimney is 2-5/8 inches and can be re-sized to fit your holder. The diameter of the bulge is 3 inches and the height as pictured is 10 inches . The bulge can be frosted and the height can be adjusted to meet your requirements. Click HERE for more information & images about the Separate Prison.. There has been a demand for reproduction chimneys that can be used without fear of them cracking due to heat shock when lamps are burned. 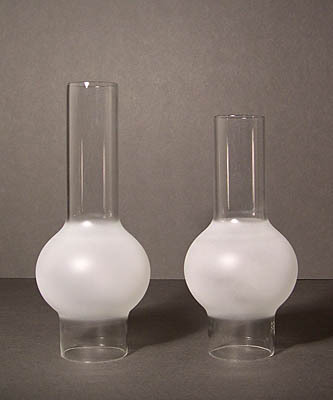 Chimneys that are made from borosilicate glass which is most commonly known as Pyrex glass can be made to fit your needs. These chimneys will withstand the stresses of heat shock and can be safely used. The photograph above pictures an original period chimney at the left. The client requested chimneys based on this profile to fit two different burners; the chimneys to the right are the result. 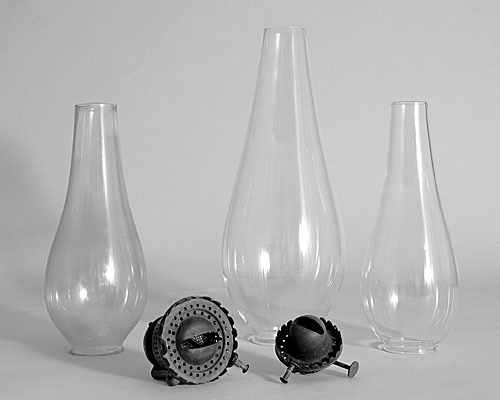 Cost depends upon a number of factors such as size, the number required, the complexity of the profile, and the amount of time needed to prepare the necessary information that is needed by the glassblower. In many instances the glassblower will have to have the burner(s) on hand so that he can fine-tune the fit of the chimney to the burner. Please get in touch for more information.